The Plantronics Encore headset is considered the top-of-the-line model that offers all-day comfort and superior sound quality. Especially reliable for call center and office professionals. NOTE: This headset has a Quick Disconnect at the end of the cable. Requires Plantronics amplifier or bottom cable between the headset and the telephone. The world's leader in communication headsets does it again! Slip on the best sounding, most comfortable headband headset yet. The Encore product embraces a new generation of headset technologics: human-factors engineering for bear-universal fit, tone controls for sound enhancement, and featherweight design for all-day comfort. Encore is the first lightweight communications headset with SES (Sound Enhancement System) tone control switch. Encore also supports the benefits of Sound Guard Plus and Call Clarity technologies: speech that is comfortable to listen to and easy to understand, plus voice transmission quality that exceeds that of many headsets. Plantronics has conducted the largest human-factors study of the ear ever undertaken to design this super-stable, super-light headset. With multiple adjustments possible, the Encore headset will fit just about anyone comfortably. The headband and turret are click-stop positionable to maintain the right fit. Binaural models and designed without a cable yoke. The Encore headset is the most rugged Plantronics has ever designed. Even the new lighter weight cables are strong. A durable turret, rugged cable strain relief, and rigid ISO 9001 quality testing, result in a headset that can take day-in and day-out use. 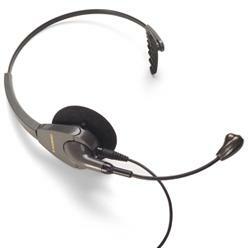 * This Quick Disconnect Headset requires Plantronics amplifier or bottom cable between the headset and the telephone.